Zotero [zoh-TAIR-oh] is a web-tool that helps you collect, organize, cite, and share your research sources. It lives in the web browser itself. You must download and install it before getting started. You can also download Zotero Standalone for Mac OS, Windows or Linux. Zotero will not work with Internet Explorer but there are connectors for Google Chrome and Safari. Download Zotero 4.0. 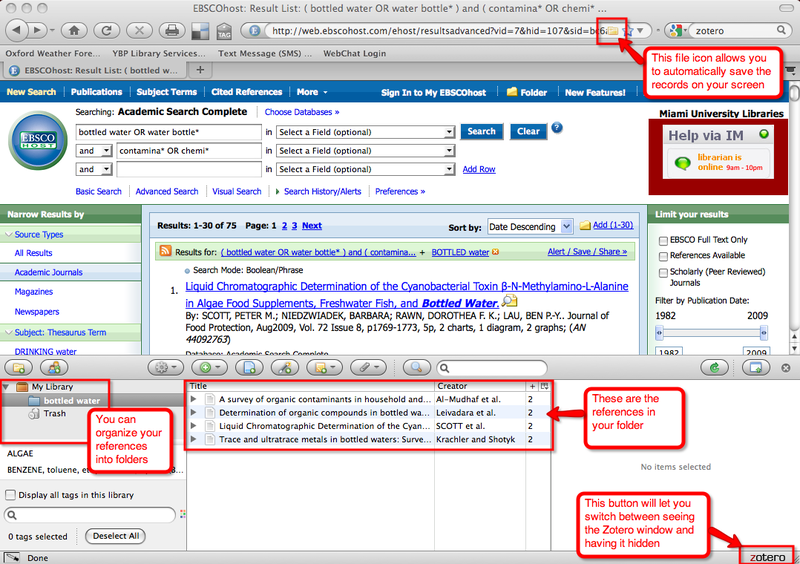 Using 4.0 you can access your references from any computer with Zotero installed. If this is your first time using Zotero, you will have to create a free account. This creates a space for you on the Zotero server and allows you to add or access your references from any computer through the Zotero interface. There are several ways to add referencs to your Zotero library. Make sure you always check the references for accuracy, sometimes Zotero can't understand everything. Click on that icon and the reference will be added to Zotero. Notice that you will also import the abstract and a link to any full text, if attached. Drag the record into a folder. Bring up the website that you wish to add to your references. This time there is no icon in the url bar. So that your data is available from any machine, and saved on Zotero's server (this way you don't have to carry your computer around) you need to sync or save your information. To do so, you must have created an account at Zotero (free) and be logged into that account. In the Zotero control bar the circular arrow is the sync button. Select the Default Output Format. If you are just doing a bibliography select "with bibliography" if applicable. Drag your reference to your word document. This one-page document covers getting started, adding items to your library, syncing, and retrieving citations from Zotero. It is an alternative printable version to the information on this page.